The one word that best describes The Blackening is "ambitious". The album is full of long multi-melody-dominated tracks that generally clock in at 8 minutes or more, with numerous themes, tempo variations, and side-quests, all propelled by boundless energy. When Machine Head pull it all together and ensure that all the pieces of the song fit together to form a meaningful and cohesive picture, the results are spectacular, as on opener Clenching The Fists Of Dissent, and Slanderous. The first two minutes and a 15 seconds of Clenching The Fists Of Dissent earn a place among the best metal intros of all time, and the rest of the track builds on that success. Slanderous, with another terrific intro, creates and maintains a dazzling, epic and mostly high speed guitar showcase powerful enough to slay all assembled monsters. Although The Blackening maintains an impressive base level of quality in the songwriting and performance, sometimes the tracks become a lining up of segments sitting relatively uncomfortably next to each other, with many good, sometimes great ideas lined up next to other good and sometimes great, but unrelated ideas. When unifying themes are not maintained or nurtured over long and complex tracks, the music remains interesting but buckles under the weight of over-exuberant variety. The bonus tracks, covers of Iron Maiden's Hallowed Be Thy Name and Metallica's Battery, are faithful and respectful to the originals, but Robb Flynn's mid-growl vocal style does not necessarily align well with traditional power or early thrash metal. 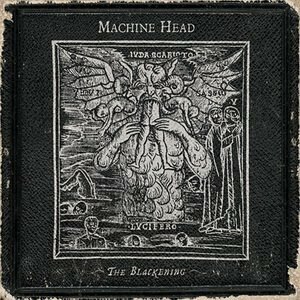 Despite not being perfect, Machine Head's ambition and willingness to take risks and create richly textured, almost orchestral music on The Blackening results in a most absorbing album. Produced by Robb Flynn. Engineered by Mark Keaton. Mixed by Colin Richardson. Mastered by Eddy Schreyer.